Two big box stores in town are now competing for my online grocery shopping business, and I may never darken the door of a store again. Y’ALL. All I had to do was get on the computer and add items to my virtual shopping cart. Did I mention, friends, the cart is virtual? No one is asking to go to the restroom in mid-trip with a cart full of groceries. No one has asked for the cleverly-placed eye-level pop tarts topped with marshmallows, sprinkles, chocolate, and a whipped cream packet to add on once they’re toasted. Instead of deafening fellow customers at the grocery store and encountering the judgy side-eye from strangers, my kids are fighting in the privacy of our own home, thanks. The virtual shopping cart does not have a huge plastic play car with the snot of a thousand children embedded on the steering wheel. 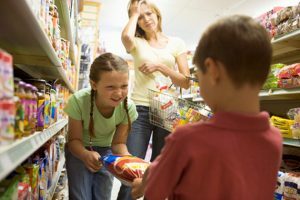 The virtual shopping cart has not run over my heels when driven by a child, nor has it blocked traffic in the canned goods aisle or needed to get around the ride-on cart that’s beeping and backing up. The virtual shopping cart is driven by angels sent down from heaven especially to mothers of young children, working people, the elderly or disabled, or anyone who needs a dang gallon of milk and some bread. Basically, all of us. Once my virtual cart was loaded, I walked away from my computer, folded a load of laundry, and popped my feet up to catch up on my book club book. I’ve had a few grocery store mishaps in my day. Any parent who has ever dared to bring children out in public has, at some point, been embarrassed by the public fits of our children. My children are masters in the art of public embarrassment. At Target, for example, 3yo Sawyer ran away from me. After a frantic aisle-to-aisle search, I found him screaming in the condom aisle. Call me crazy, but I’d bet that a screaming 3yo is WAY better birth control than Trojan could ever hope to be. But…(I hesitate to to even type this…) my kids are becoming easier in public. Now…just when online shopping is taking off…I don’t need it as much. 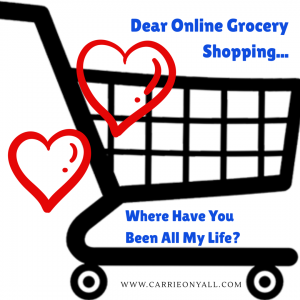 Online grocery shopping, where were you when I was REALLY in the trenches of parenting? When my kids were 6, 2.5, and a newborn, I cried because my husband was out of town, we were out of EVERYTHING, and I didn’t know how to grocery shop with three small kids. Where were you when I had 3 kids on antibiotics or when our entire family had a stomach virus that would have us all praying to the porcelain god for 6 hours per day for two days? Where were you when the diapers and wipes ran out all at once? I can barely talk about that day now. Where were you, online grocery shopping? My guess is that some executives at Walmart or Kroger had a baby. Or twins, maybe. One day, the executive tried to take the kids to the store but had to leave a cart full of groceries because life happened. On the same day, I bet the executive’s grandmother who recently had a hip replacement called and asked for a few things from the store on the way home. I’ll bet that executive thought, “Wouldn’t it be great…?” And the idea was born. Now, there are days when I just want out of the house, and the grocery store is a good escape. The husband can’t fault me for spending a bunch of money if it’s at the grocery store, right? Wandering the aisles silently, listening to a book on my headphones is cathartic. And if I need a last-minute item, taking the kids in isn’t so bad anymore, and I’m left to wonder how we all made it through those years. While I was shopping with my 3yo the other day, I saw a mom with four children (two sets of twins) under four years old. She bravely walked in with a baby strapped to her chest, a baby in the carrier on the top of the cart, and two well-behaved kiddos holding onto the sides of her cart. It was an amazingly brave act…I asked if she needed any help (free babysitting), and she just smiled and said she was good. 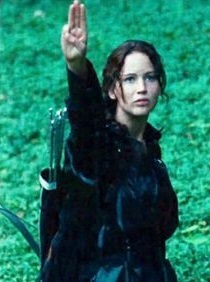 I gave her one of these. Mom with all the kids, online grocery shopping is for YOU. Rock that, girl. You’ve earned it.